Able2Extract PDF Converter with OCR for smartphones and tablets is a lightweight and easy to use app for creating and converting PDF documents. 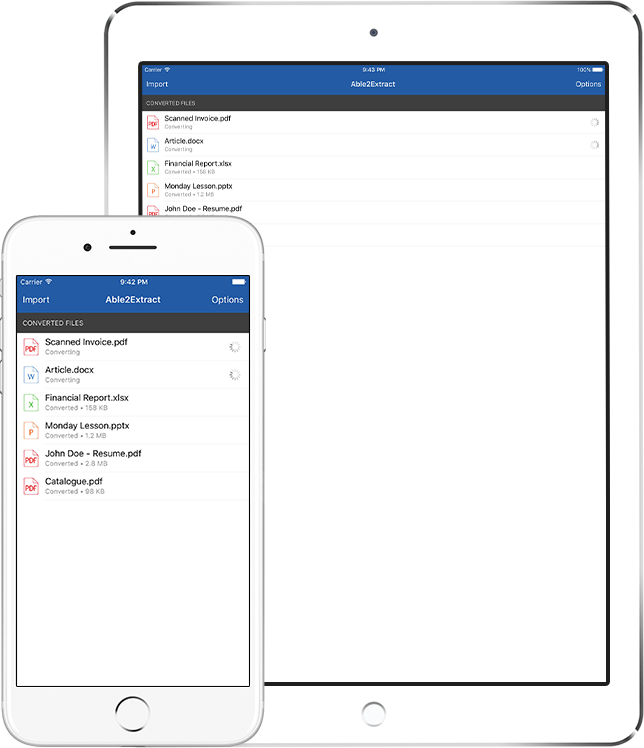 Available for iPhone and iPad, users can create PDF from MS Office documents and convert PDF to Word, Excel, PowerPoint, images (jpg) and AutoCAD (dwg) files. Before you follow the steps below, make sure to close Able2Extract iOS if it’s running in the background. Convert PDF to Microsoft Word for free on your iOS and Android smartphones and tablets. Create PDFs from MS Office documents with the lightweight Sonic app created for iPhone and iPad. Convert images to PDF, Word, Excel, and PowerPoint for free on iOS devices using JPEG Converter with OCR app.